From London’s Buckingham Palace to the Palace of Versailles, from Esterházy Palace in Hungary to Catherine Palace in St. Petersburg, the main gates that provide the first line of security to so many castles are stunning lace motifs wrought of iron, and gilded with gold, instead of knit with two sticks and some string. At least, that’s what a kind knitter thought of when she suggested Palace Gates might be the perfect name for my latest design. 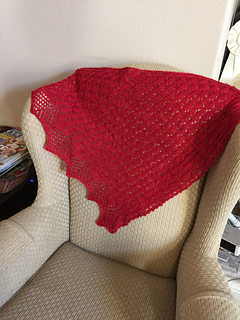 There’s been a new twist to triangular shawls lately, a new canvas, as it were, for lace and color, one that other designers have been playing with, and I haven’t. Until now. Palace Gates is my first go with this new triangle. I think I’m hooked. 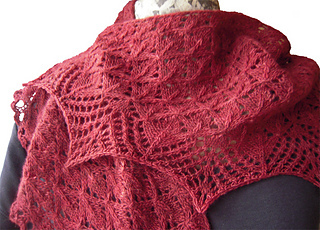 Knit in one piece from a four-stitch cast on, this shawl will grow and grow, until you reach the size you want, run short of yarn, or just get bored. 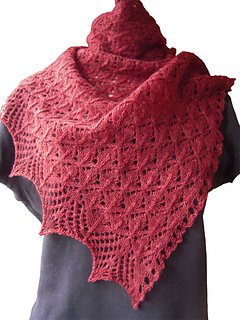 So long as you work an odd number of main repeats, you can stop anywhere, work the border rows, then bind off. I’ve already done the math for you for four sizes. Tips are included for making the border bigger, if you want to use up the last bits of your yarn. Size (width at base x height): 35.25 x 34 (42 x 39.25, 49 x 44.25, 56 x 49.25) inches; 89.5 x 86.5 (106.5 x 99.5, 124.5 x 112.5, 142 x 125) cm. 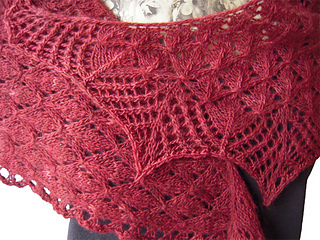 Skills: k2tog, ssk, yo, double yo, s2-k1-p2sso, knit into front and back of same stitch, wrap stitches, slip st at start of row. Notions: Stitch markers are optional.